Interviewed on The Mark Levin Show, Rep. Paul Ryan (R-WI) described the Democrats' cynical attempts to game the Congressional Budget Office (CBO) estimate for their brand new entitlement program. As a reminder, our existing entitlement programs -- Social Security and Medicare -- are only $100 trillion in the hole right now. 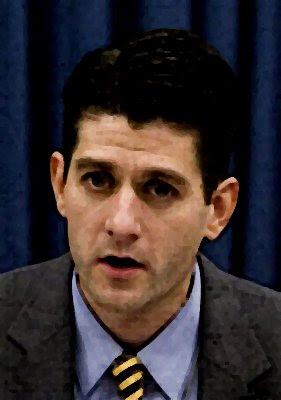 Ryan: I've got CBO working on a letter for me to hopefully get tonight or tomorrow to just re-verify the facts. They are taking ten years of tax increases and Medicare cuts to pay for six years of spending. They're taking the 'Cadillac Tax' and shoving it outside the [ten-year, CBO] window. They added a brand new tax on investment income [Ed: well, that should help the economy!] that's must higher... that's $210 billion of new taxes that we just got an hour or two ago. And they're moving money out of this ten-year [CBO] window so much to manipulate this score to try and make it look like this thing comes in under a trillion dollars and actually reduces the deficit. They don't count the 'Doc Fix', that's $371 billion right there... Medicare physicians are slated to get a 21% cut in their payments next month and everyone is proposing to prevent that from happening. Congress, for the last seven years, has prevented these Medicare cuts from occurring... and all of these bills said, "We're going to prevent these Medicare cuts from hitting the doctors" because we know about 25% of doctors will just drop taking Medicare patients if this cut occurs. And so... they took this spending provision out of the bill and left it as a separate piece of legislation. So they took $371 billion of spending and took it out of this legislation! [There's] $72 billion in Social Security taxes that they're counting twice; that's supposed to go to Social Security, but is a raid on the Social Security trust fund. There's $50 billion in premium for a new entitlement for long-term care insurance; these premiums, like any insurance, should go to insurance, but they're taking them to go to this new entitlement! Levin: So they're taking money out of Social Security; they're taking money out of Medicare; new [LTC] premiums, they're taking that money; ...so we're at a trillion dollars of Madoff-style fiscal fraud! Ryan: That's right. And the Congressional Budget Office can't tell you this. Because their statute is that they estimate whatever you put in front of them. And if you put in front of them garbage in, you'll get garbage out. If you put in front of them a manipulated bill and all of the smoke and mirrors, they have no choice but to score the bill as you wrote it. And if you write it intentionally to disguise all of this, then you'll get a disguised estimate, and that's what we have here. Precisely the reason I'm organizing the Impeach & Convict Tour 2011. Because you can't be too careful with Democrats: they're like cockroaches. Update: Reps. Stupak and Cantor: Democrats Still Don’t Have the Votes. There are no more intimate generational relationships than those which exist between members of a family; a parent and a child, a grandparent and a grandchild, etc. Passing of family heirlooms, traditions, and values sym-bolizes the importance of these relationships, and represents the custodial responsibilities one generation has fulfilled in preserving, protecting and defending that which they received by way of inheritance from a previous generation. When one generation fails to honor their responsibilities, the generational chain of trust is broken, and intra generational respect suffers immensely. The current custodial generation received the chain of trust intact, and along with it numerous opportunities. However, they’re finding keeping the generational chain of trust intact overwhelming. For each billion dollars of new credit card debt put on their children and grandchildren the chain grows weaker. Nothing demonstrates the dramatic erosion of generational responsibilities better than the current intra generational abuse that began in 1983, when social security reform legislation was signed into law. It was promoted as a plan to avert near term social security bankruptcy, and to fund a long term funding solution. Average working Americans began overpaying their social security taxes by billions of dollars annually. With their overpayments being deposited in a “trust fund”, most Americans believed they were doing their part in alleviating senior fears, and at the same time building a fund for the now retiring 78 million baby boomers, thus providing tax relief for current workers, and their families. With no choices, and in spite of significant financial hardships, millions of average hard working Americans struggled to keep their end of the bargain. Politicians however, chose to renege on their end of the deal. From day one, they’ve spent excess social security trust fund retirement dollars on something other than intended, by transferring excess trust fund retirement dollars to the general revenue fund. Once comingled with other tax receipts, they lose their unique identity, allowing politicians to fund sweetheart deals for special interests. Using Bernie Madoff slight of hand deceit, politicians cover up their taxing and transfer scheme by replacing excess social security trust fund retirement cash with special obligation bonds, or IOUs, that are represented as assets on the social security trust fund balance sheet. IOU obligations created by this political taxing scheme will have to be paid again plus interest, and now exceed 2.5 trillion dollars, growing at several thousand dollars a second. Some inheritance we’re passing along, huh?? Now the blame someone else banner is being hoisted again. Messages via speeches and placards at caffeine parties, are bolstered by the voices within the “airway lord” daily talk show circus. Considering the past 25 plus years of financial assault on middle class working Americans, how can drinking another kool-aid cocktail served up by another political Bloviator be considered a viable solution; the answer is, it can’t. The solution resides within the current custodial generation, and their willingness to speak up and reach out in a spirit of cooperation to the next generation/s, Ending the vigil of silence that’s permitting politicians to financial enslave our own children and grandchildren, under the pretense of saving social security is a good starting point . The social security taxing scheme must be acknowledged for what it is, and energies must be refocused from the next election to the next generation. These actions can serve as an appropriate first step in restoring generational commitment. If you’re a member of the current custodial generation, you have an obligation to restore the generational chain of trust while there’s still time; it cannot be passed along to the next generation with a broken link.